San Francisco Open Studios has been going on all of October. I have live tweeting from my various studio visits each weekend using the hashtag #SFOS. 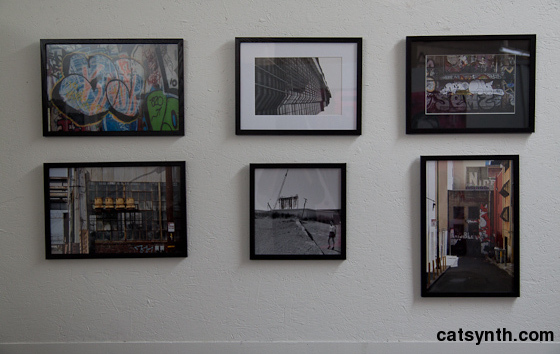 But as both the month and Open Studios draws to a close, we look back and my own experience on the first weekend, showing my photography at Art Explosion and in the showcase at SOMArts. The works were mostly drawn from the same set that I featured in the solo show at The Parts Room in Oakland in early September, include the “triptych” of the large red, blue and yellow pieces. The show in Oakland was a great experience, the best visual arts show to date. And I learned a lot about hanging which I put to use for Open Studios. This was most true for the showcase at SOMArts, where I showed up fully equipped to have my piece perfectly centered and mounted in the allotted space. The tools and meticulous measuring and drilling of holes seemed to impress the staff at ArtSpan. And the work paid off with the end result (though the camera distorts the leveling a bit). During the preview party, I received numerous positive responses from visitors and various people in the arts community. The response at the studio itself was also positive. There weren’t always a lot of people visiting, it came in waves throughout the weekend, but those who did come were quite engaged. I received both positive and constructive feedback over the weekend. One thing that is clear is the strongest works are those, like the “triptych” that focus on details of the urban landscape, a particular shape or pattern or color. Those are also among the most rewarding to work on, so I will likely focus more on this in the future. I will probably continue to have humorous pieces as well. People of course loved the big orange cat. The doll was a lot more polarizing (see the most recent Wordless Wednesday for an example), with some people really liking it and others hating it. Open Studios has become a semi-annual experience for me since moving to San Francisco in 2008. Each time, I frenetically go from studio to studio in my guise as a reviewer and collector, seeing large amounts of work and interacting with artists. 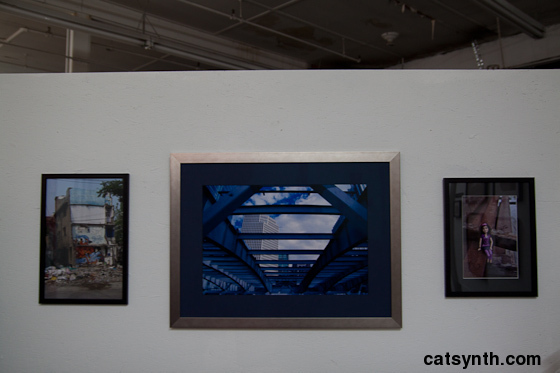 This time the tables were turned, as I was presenting my own photography work as part of the Spring Open Studios at Art Explosion. So rather than reviewing art, I will be reviewing the experience of presenting art, and interacting with viewers. Art Explosion is composed of two large buildings of artists’ studios in the ambiguous industrial neighborhood between the Mission and Potrero Hill. It was often one of the first stops on my Open Studio tours, and the small open studios were and supportive community were a natural choice for presenting my work. I had two walls of an open studio space, along with additional space in the main hall and one piece in the entranceway (every artist had a piece here as part of a “sampler” wall). You can see the three walls in the images below (click on the small images to enlarge). In all, I had 16 pieces featured. Additionally, I made a few “mini editions” of some of the pieces (4×6 inches) and had two video presentations of works that were not physically part of the show. Over the three main days of Open Studios (and an additional Saturday the week after), I sat and waited as people walked by and sometimes stopped to view my work, and occasionally ask questions or give feedback. Some walked through without stopping to look, others spent a couple of minutes viewing intently without saying a word, or maybe a quick “very nice work” before wandering off. But a decent number of people did ask questions or more detailed responses. The most common questions I got were about the locations of the photographs, i.e., “Where was this one taken?” All the pieces I presented were from the Bay Area, New York or Shanghai, and discussing the locations or having viewers try to guess which was which became part of the interaction. There were definitely clues in each, in particular the more exotic architecture of the Shanghai high-rises and the distinctive San Francisco “No Parking” signs. Very few people were able to recognize the half-demolished overpass from the Transbay Terminal in San Francisco featured in the largest piece, though this one was among pieces most positively received. The other pieces that seemed to receive the most intention were Asians.com (Invisible Bike) with the big orange cat, and Dragon (Moganshan Lu) with the dragon mural, half-demolished building and garbage-strewn street. I did an experiment moving these two pieces around after the first day to see if it was the location or the content that attracted people, but they still seemed to get the most attention. I had not predicted that Dragon would get so much attention – or eventually be the first large piece to be sold! It was one of those interesting surprises when exposing the work to public viewing. I also had an interesting conversation about the location in 5348, one of two pieces in the show featuring a model. I have used that building on multiple occasions, with its mysterious mess of hanging cables. It turns out that someone who came through and saw the show was familiar with the building and the people who owned it, and informed me that the structure with the cables was in fact for lifting large objects, freight, etc., but had not been in use for a while. A group of viewers said that the big orange cat was part of a scavenger hunt they participated in. ]Some people seemed more drawn to the aesthetics of individual pieces rather than the subject or context – like me, the focused on lines and textures. Among these viewers, 7059 (Blue) got the most attention. A few viewers did try to look for “musical” elements within my work after learning that music was my primary art form – they noticed repeated patterns and motives in the lines. Overall, it was a good experience. I was able to show my photographs in physical form to a large number of people and received quite a bit of positive feedback. 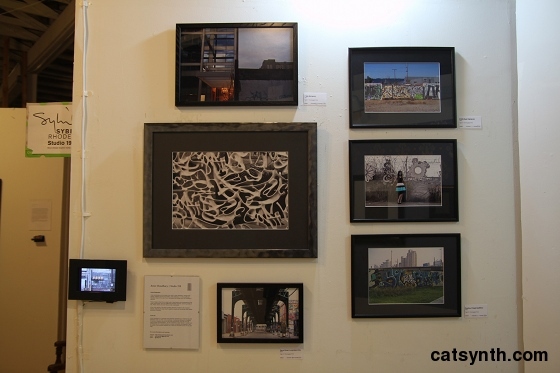 Among those who came to see the show were a few of the artists I have reviewed here on CatSynth in the past, which was very gratifying; and many friends came by over the four days I was showing. Selling a large piece and a handful of miniatures, of course, nice as well. Interestingly, I also managed to sell some music CDs. Some things I may do differently in future shows is have a larger variety of miniatures on hand – e.g., at least one of every piece I think can be reasonably represented in a small size (some just don’t look good small). I may also experiment with different types of framing and mounting – this was probably the hardest part of preparing for the show. One unfortunate aspect of presenting my own work is that it left me very little time to explore and see what others were doing. I did take a few breaks to see friends as well as discover new work, though not at the level of detail I would have done in previous shows. You can see images from Open Studios at this flickr set, or visit my page at Art Explosion. After much work and excessive anticipatory blog posts and tweets, Spring Open Studios starts tonight! If I can, I will try and live tweet @catsynth wish hashtag #sfopenstudios. It will be interesting to experience an art event from the point of view of a presenter rather than a viewer. This is a separate wall from those I showed in this previous post. I felt it was a bit unbalanced, so I added one more piece to the upper left, directly above the large picture. One of the many countless details I have dealt with incrementally over the process. The biggest challenge has been taking what was essentially purely digital and changing it into physical objects. It’s one thing to post a photo every Wednesday, it’s another to print, matte, frame and hang it. One of the things I am interested in seeing tonight is how the experience differs from music, and from the performing arts in general. It’s October, so once again it is time for Open Studios here in San Francisco. We at CatSynth will be out and about, revisiting friends and hopefully finding new art and artists as well. This time, in addition to full articles, I will also be “live tweeting”. You can follow @catsynth or with the #sfopenstudios tag. If others use it, too, it will be all the more fun.